We have released the program to improve the functions of KENWOOD Music Editor. Stability and total performance has been improved. Situation for the case when below models doesn't appear on the target model list, has been improved. The function which constructs the database without registering a USB device has been added. The dynamic playlist function (which can specify search conditions) has been added. The function which automatically creates a playlist when registering the target has been added. The function which searches artist or album information on the Internet has been added. Music editor is made compatible with the main part scan and main part search functions by using a CD/USB receiver in 2008 model. The crossfade play function (target: Model group D and a compatible firmware) has been added. The problem has been solved so that wrong songs are not played when songs with too long file name are written to the CD-R/RW. The problem with the names of the files transferred to the USB memory or CD-R/RW has been solved. Music Editor is made compatible with Windows Vista (32-bit version). The function of the file list view has been enhanced. The time required for music data analysis has been reduced. You can use the update program only when you agree to the terms of "Software License Agreement". Read it well. If you agree to it, download the update program. 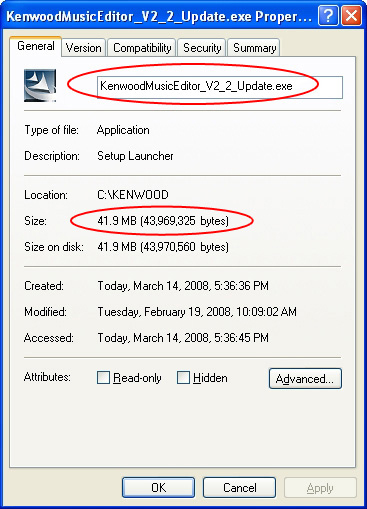 Click "Update Program download (KENWOODMusicEditor_V2_2_Update.exe)" to download the update program. When downloading is completed, check the name and size of the downloaded file using Explorer. If the name and size of the downloaded file are the same as those of the original file, downloading is successful. If the name and size of the downloaded file are not the same as those of the original file, delete the downloade file and retry downloading. The update procedure must be executed by the system administrator. Terminate all programs running now. Double-click the icon of the downloaded update program. A dialog appears. Start the update process following the instruction displayed the dialog. The update process will be completed a while later. To check the current version, start KENWOOD Music Editor and select [About] from the [Help] menu. Now you are finished with the update procedure. You cannot execute the update procedure if KENWOOD Music Editor Ver.1.0.0 to Ver.2.1.0 has not been installed in your PC. If KENWOOD Music Editor Ver.1.0.0 to Ver.2.1.0 has not been installed, install it in your PC before executing the update procedure. Start KENWOOD Music Editor and select [About] from the [Help] menu. The version of the installed KENWOOD Music Editor is displayed in the dialog. Selecting the downloaded file and right-clicking will display the Context menu. You can check the file name and file size. A written permission from KENWOOD is necessary in order to redistribute this software on your personal web page. KENWOOD is the sole owner of all copyrights and intellectual property rights of this software and accompanying manuals and other documents. This software is not sold but licensed to the user by KENWOOD Corp. The customer has ownership only of the media containing this software and the ownership of the software itself is reserved by KENWOOD. KENWOOD Corp. does not guarantee the suitability of the this software or its quality and function for the customer's use and will not be liable for any problems caused by the use of this software except as explicitly noted. The customer is responsible for the selection and installation of this software as well as the result of using this software. * Microsoft, Windows, and Windows Media, .NET Framework are registered trademark or trademark of Microsoft Corporation in the US and other countries. * Intel and Pentium are registered trademarks or trademarks of Intel Corporation in the US and other countries. * Musicsommelier is a registered trademark of Matsushita Electric Industrial Co. in Japan and other countries. * QuickTime is a trademark of Apple Inc., registered in the U.S and other countries. * Other system names and product names are registered trademarks or trademarks of the respective company. Symbols (R) and TM are omitted in this manual.